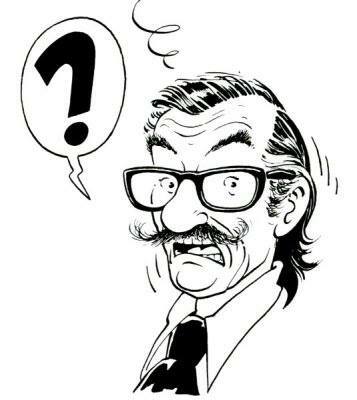 On December 31st 1954, the Flemish newspaper Het Nieuws van de Dag (not to be confounded with the Dutch newspaper De Courant/Nieuws van de Dag) announced a brand new story of Bob De Moor‘s ‘De avonturen van Nonkel Zigomar, Snoe en Snolleke’: “Het Mollenrijk”. It would take 26 years before it would be released in an album format – in french via Bédéscope on 2000 copies – under the title “L’empire des Taupes”, and 48 (!!) years before it would finally see a publication in its original Flemish form, on 775 copies; and this thanks to the work of the people behind Brabant Strip who dug the material up from their archives. 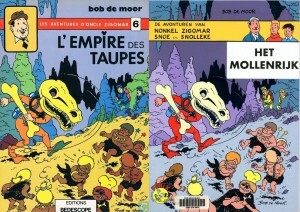 The 1980 Bédéscope version on the left, the Brabant Strip version on the right. There are quite some differences between both versions which you don’t see on first sight, but they do jump forward when you look closely. Today we’ll handle the cover artwork and tomorrow we’ll take a closer look at the content. In both cases the cover of the album was a cover Bob De Moor had drawn in 1979/1980, with minor differences. First of all, the cover of Brabant Strip seems to hold the complete ‘borders’ too, which were hidden on the Bédéscope version. As a result you see some extra details on the left and right, and on the top and the bottom. 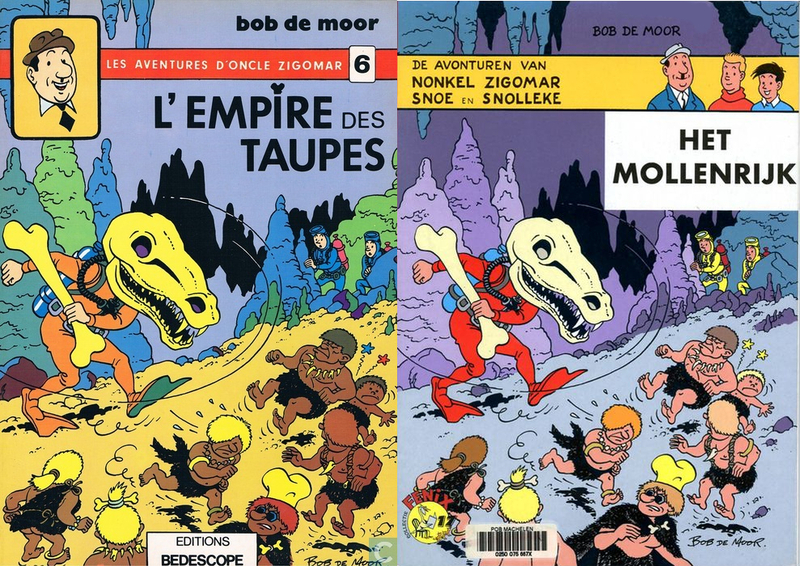 But don’t mistake, some corrections were made too, for instance the Bédéscope version has stalagmites on the right which were cut off in the Brabant Strip version to put the title. The Brabant Strip version also has 2 extra stalactites added in the upper right corner (probably drawn by Johan De Moor – we’ll confirm this). You will also see in the Brabant Strip version that the stalactites in the upper left corner have been corrected, for example where originally Oncle Zigomar‘s head was. Again, we think that these corrections were made by Johan De Moor. Something that also is quite remarkable is the coloring used for both covers. Whereas Brabant Strip decided to go for a more natural coloring of the characters and environment, Bédéscope went Hawaiian style rendering the whole venomously greenish. Up to you the reader to decide which one you prefer the most, but we’ll stick to the Brabant Strip version. The biggest difference between both versions however can be found inside the album. But that’s for tomorrow’s news when we dive into some local politics that influenced not just Bob De Moor but many others like Marc Sleen, Willy Vandersteen and so on. Especially for this article we did some traveling and you’ll also learn a bit how Flemish cartoonist incorporated politics into their work.